As a trainer I’m always looking for ways to improve the quality of the exercise routines for both my clients and myself. I’m also a strong believer in using highly productive, functional exercises, incorporating a lot of bodyweight training, compound movements, and unique training accessories. However, when it comes to bodyweight training, many exercises are either too easy or too challenging for many people. So when I first heard about the Jungle Gym straps I was interested. (Check out my review of this product in the video above). When many of my clients begin training with me, they are not yet strong enough to perform regular pushups or chinups. More advanced trainees need a greater challenge than their own bodyweight usually provides. The Jungle Gym exercises can be modified (depending on what angle you are training at) to provide a challenging workout appropriate for fitness enthusiasts at any level. The Jungle Gym is also an amazing accessory for those who are busy or who travel a lot. You can perform exercises like rowing, strap pushups, and a series of other upper and lower body movements on the road by simply hooking the Jungle Gym up anywhere (on a door, tree limb, or an overhanging bar or beam). The unique “unstable” design challenges you to adapt and stabilize yourself, which also forces you to involve your core muscles. Now anyone can achieve a complete workout on their own, anytime, anywhere. 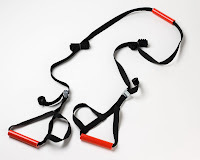 The Jungle Gym is similar to many other body weight “strap” training systems on the market today (such as the popular TRX), but it sells at a fraction of the price. Overall, the Jungle Gym is an excellent, light weight, convenient training accessory which both my clients and I have been very pleased with. I now carry this product myself, so if you're interested you can pick one up at Jungle Gym Training.